@Ashley_Albus I plan on writing there maybe in the next few months or so! Angie will be spending the fall semester in Ireland and I suspect Haley will be at least visiting her there. Oh Oh Oh, Oh MY!!! Haley just picked up a follow on twitter from Don Bailey, kicker with the Dallas Cowboys. 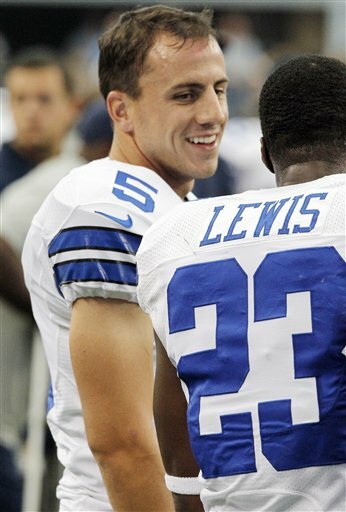 Quote: IRVING, Texas -- Long known as a team that saw kickers as interchangeable pieces, the Dallas Cowboys have signed Dan Bailey to a seven-year deal, the team announced Thursday. Bailey received a $4 million signing bonus and $7.5 million of the $22.5 million deal is guaranteed. Bailey, who turns 26 on Sunday, was set to be a restricted free agent. The deal runs through 2020. The Cowboys were likely to use the second-round tender on Bailey worth $2.124 million before striking the long-term deal. Signed as an undrafted free agent in 2011, Bailey has made 88 of 98 field goal attempts in his three seasons, missing just four kicks in the last two seasons. He made 28 of 30 tries in 2013, including six of seven from 50 yards or more. In his first two seasons Bailey made 5-of-9 attempts from 50 yards or more. He also had 57 touchbacks. I think I'm going to change my search engine from "Google" to "Miguel"
@glassperfection @PiaToscano @NHLBlackhawks Wait a minute, I am sooo a Hawks fan!!!?? @PiaToscano @glassperfection @NHLBlackhawks Haha oh stwappp it I'm blushin! ☺? @PJHaleyR I have a bad case of the stomach flu.. But I still plan on attending ze fun. (pray icon) for meh!! Click the 'time' it was tweeted, to the right of your @...example: "@HaleysTusk 3m"